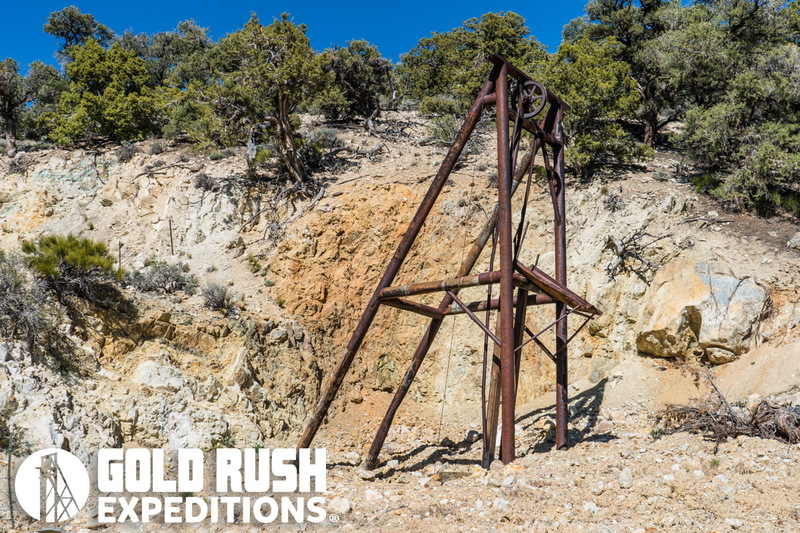 The Sylvania Mining Claim and Camp is an expansive and well documented producer of Silver, Gold, Lead and some Tungsten. The mine has been worked since well before 1900 by a small group of Mexicans, the mine was purchased by the Clair Family in 1904 who began earnest development of the gold and silver deposits on the property. According to documentation, maps and historical assessments, the Sylvania Mine Property; as written by Gold Rush Expeditions, Inc, covers the Bullion, 4 Aces and Sylvania Mines. There is a total of 80 acres of which encompass all of the workings pertinent to the mining activity. The claims encompass all old mining outbuildings, workshops and miners quarters including a small spring in the camp. The mines were last working in 1974-76 according to historical documentation. This matches closely with surveyor’s observations that dated last workings to the early 1980's. The adit portals were gated and the primary (No. 1 or Stateline) shaft was secured in 2008. There has been no sampling or other work executed on the claims since 1976 when the last operation closed up. The primary output is reported as silver and lead with minimal gold according to documentation. Our surveyors disputed this reporting based on a massive gold shaker and a trommel located on the claim. Trommels and shakers are not used for silver or lead separation, only for gold. There was a large and comfortable operation which consisted of a series of houses, workshops, and various other buildings on and around the property. The trucks and machinery that were purchased in support of the mining operation were of most current technology and up to date for the era of use. A small spring provided water to the camp and the mine operations. It is still in place and usable as is today. Surveyors were able to access the 155 level of the workings but were not able to survey the shaft as it will need to be excavated and stabilized prior to entry and survey. Air quality in the 155 was consistent at 20.8 with no other elevated elements. The mines are cut into hard rock and show no areas of concern. Total workings are reported as roughly 1600’ linear feet. With DMEA improvements and documented expansion, these workings are estimated to now be closer to 3000’. Inside the 155 Mine, surveyors reported massive blocks of quartz. This is intershot with visible galena and some small flecks of gold. The Sylvania can be accessed from the California (West) side of the canyon or from the Nevada (east) side. Access roads are in excellent condition and could likely be navigated by a 2WD vehicle with good clearance. The Clair family leased the property to Bullion Consolidated Mining in 1922, who built a 30-ton concentrating mill on the property. Bullion Consolidated Mining was infact the Clair family under a corporate identity. The property did very well and would have remained in small scale development if not for the War Act which bankrupted the Bullion Mining Company. The assets of the property were sold off at auction and surprisingly the Clair family purchased the properties. The Clair family took the property back over in 1945 and worked it for 30 more years, producing Tungsten for a Department of Minerals Energy Administration grant in 1956-57. The mine stayed in small operation until 1976 according to documentation when Don Clair of the family passed away and the mine was shuttered. From 1945 until 1976 the mine provided ample income for the Clair family and their children who lived on site. The level of production or materials was never disclosed to any outside sources. Ores were milled, and bars were poured onsite with no outside interference. Gold and Silver bars were sold and traded for good in Tonopah and according to local accounts, Mr. Don Clair refused to use or accept any paper dollars or other consideration except for gold and silver coins. It was reported by a local in Tonopah, that the Clair family was a regular in town, purchasing many items for mining as well as many creature comforts. When patriarch Don passed in 1976, the family took the sizable fortune that they had been building in dore bars and happily left the property never to return. It is well documented that the mine never reached even 1/10 of its potential as the Clair Family was outwardly hostile towards any attempt at acquisition or purchase. In fact, the Bullion Mining Company was only allowed the lease because of close ties with the family. When the family finally decided to market the property in the early 1990's, there was no market left for the “abandoned mine”. Through a series of various mishaps, the claims ended up lapsing in the early 1990's and were picked up by various small miners, none of which did any development. A 1959 unpublished report on the property by J. Paul Jones, a Mining Engineer contains a very favorable report on the mine and the profitability of the site. Mr. Jones dies suddenly in 1959 and Mr. Harry Hughes took over some of his information and completed the report. Mr. Hughes was a licensed Geologist and Mining Engineer completed a report on the Sylvania property and also found it highly attractive and stated that there was significant profit to be had at the site. These reports were contracted by the Defense and Mineral Exploration Administration, regardless, they are written by qualified persons and report that the property has extensive development potential.